Nearly an entire city block at the western end of Carytown is set to be razed and redeveloped. 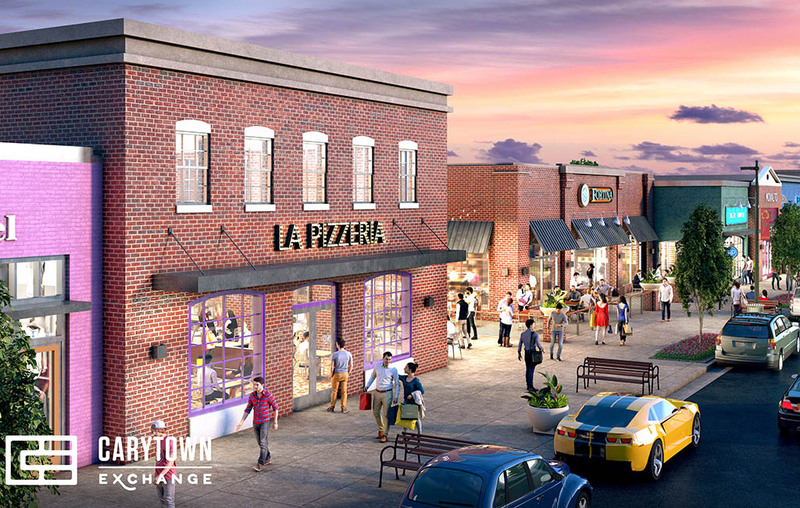 Regency Centers, a Florida-based developer, on Tuesday unveiled plans for Carytown Exchange, a Publix-anchored shopping center that will replace the Richmond Shopping Center. The development, expected to cost between $40 million and $45 million, will house 120,000 square feet of retail space bounded by Thompson, Cary and Nansemond streets and Ellwood Avenue. That includes a 49,000-square-foot store for Publix, which is still finalizing its lease, and 71,000 square feet of additional retail space that will face West Cary Street and Ellwood Avenue, providing room for about 25 additional tenants. Regency will raze the now-vacant Martin’s grocery shell along with nearly every other building on the block, excepting the CVS at 3514 W. Cary St. which will remain intact and in operation. Chris Widmayer, Regency’s vice president of investments, said the project has been six years in the making. “(We were) waiting for the right time to go and execute on it, and the real opportunity was when Publix bought the lease from Martin’s,” Widmayer said. Ahead of Martin’s exit from the Richmond market in summer 2016, Publix purchased the grocer’s lease on the building. It has been vacant since Martin’s closed the last of its Richmond stores last summer. Regency will not purchase the land, which has been owned since 1913 by the family of the late Hilton W. Goodwyn, who served as city attorney for the City of Manchester when it merged with Richmond. Cushman & Wakefield | Thalhimer’s Connie Jordan Nielsen, Jim Ashby and David Crawford have been retained as leasing agents for Carytown Exchange. Widmayer said pre-leasing is starting now and they’re targeting high-end retailers and restaurants to fill out storefronts. The center will feature a parking deck accessible from Ellwood Avenue and add 100 parking spaces to the shopping center. Demolition is set to begin in 2019 and Widmayer said Publix could open as early as 2020, with the rest of the development being completed in 2021. Regency’s next step will be to file plans with the city. Freeman Morgan Architects is designing Carytown Exchange, and Widmayer said it has not yet selected a general contractor. The announcement comes months after tenants in the shopping center began their exit, citing at the time uncertainty regarding their leases. Carytown Teas, Chrysalis Institute, Chasen Galleries, Eclectic Stuff and InStyle Hair Salon are among those that have either moved or announced plans to move. Widmayer said he is unsure when the rest of the retailers in the Richmond Shopping Center would close down. CVS will remain open through construction. In the winter, Carytown Burgers & Fries’ operations manager Jordan Leonard said the burger joint’s lease at 3500 W. Cary St. is good until October, and that it is looking for a new location. Councilman Parker Agelasto, whose district includes Carytown, held a community meeting Tuesday in the former Martin’s store to discuss the project. Representatives of Regency Centers and Publix attended. Carytown Exchange will be Regency’s fourth development in the Richmond region, joining Hanover Village in Mechanicsville and Gayton Crossing and Village Shopping Center in the West End. 16 Comments on "Plans unveiled for Carytown Exchange"
this is going to make a great anchor for the west end of Richmonds most successful retail district. kudos for Regency and Publix for a terrific site plan design. My concern is that the parking deck can not just be accessible only from Ellwood. The street is one way and will make traffic in and out of the center VERY, VERY inconvenient and congested for most people. They need to consider “alley” entrances along Cary, Thompson, and Nansemond Streets. Otherwise the concept is great with the return of street front retail along Cary and Thompson. No worries as that does not appear to be the case. The posted plans show upper garage access from Cary and exit points on Cary and South Thompson with the lower entrances / exits on Thompson and Nansemond. Both levels are connected in the center. As soon as you have parking access available from Cary, that’s what everyone will end up using, which will only add to the general traffic nightmare that is that block of Cary. Traffic flow around the entire Kroger/Publix-to-be/Fresh Market/Ellwood Thompson needs to be redone, as right now it is a disaster. Unfortunately, I don’t think a key components – widening Nansemond and Floyd, as well as making Nansemond and Thompson one-way each from Cary to Grove – are options. What a great design! Thank you! It will allow us local carytown residents a chance to shop at legit retail stores without having to drive to short pump. That’s going to improve the quality of our lives. I’m sure the usual “don’t big box Carytown” crowd will come out again just like they did when Fresh Market, Petco, Panera and Chipotle came in. Ignore them. For real. How many second hand clothing shops do we need? Rob, I would say we need them since the laws of supply and demand is allowing them to exist. If they weren’t needed wouldn’t they all be out of business by now? It really is nice being able to walk to Fresh Market and Petco rather than drive to the suburbs. If only we could get an urban format Target near by for the rest of the essentials as I hate dumping money over the city limits. Go to the Stratford Hills Target, Walmart, and Lowe’s to keep your dollars in the city! Sadly, Stratford Hills is too far from the actual city (plus a toll) and arguably are the suburbs. Thankfully, we do have Lowes in town. Notice in the renderings the cyclists are having to ride on the sidewalks? Not good…..
Nice catch. Isn’t that even illegal? Great. But preserve the 1840 house on the corner. It’s not in the way, the size fits the scale of the rest of the development, and it’s probably the oldest structure in Carytown. They aren’t making 180 year-old houses anymore, so once it’s gone it’s gone. I totally agree, please incorporate it into the plans. It’s will preserve history, look beautiful, appease a lot of people, and truly be “eclectic” ! Love, love, love, the idea of keeping it. The historical Byrd Theater at one end and the historical toll house at the other. You can gut the insides if you need, to but what a better way to welcome people to Carytown with a cool historical toll house!